Apart from making simple and minimalistic designs and maintaining couple of websites on the Internet I am also enthusiast beekeeper. I keep bees in top bar hives which are simple hives made out of scrap wood. Anyway since I love bees I decided to make simple template with beecomb pattern. 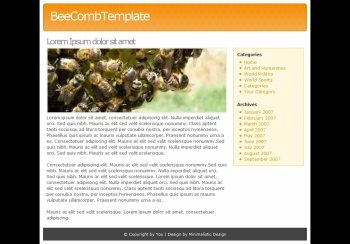 Of course this template can be used in any way you want and not just for beekeeping sites since beecomb is quite popular pattern among people. This one is simple 2 column template and is very easy to customize since it is fixed width with floated divs so you can easily move menu from right to left. Hope you like it.